But now, thanks to the wonder of changing language, translucent is also going to have to mean transparent, or semi-transparent. Pellicle, semi-silvered, whatever term you wish to use. Unfortunately, for this writer the misuse of the word translucent stands as one of the biggest schoolboy howlers ever imposed on the entire world by the ignorance of a corporation. It’s such a glaring error I can hardly bring myself to use the term – others, like Dave Etchells, have happily assimilated the new meaning into their technical lexicon. And as the video above shows, they’ve made it into a trademark, a permanent part of the future of this technology. Adjective: (of a substance) Allowing light, but not detailed images, to pass through; semitransparent. (the semi bit of semitransparent cited here seems to mean semi-detailed, vaguely delineated – not slightly darker; otherwise the primary definition of the word is diluted). There has been some heated argument on dPreview forums about this post of mine (my view is shared by many). No-one has made the point that words evolve to have useful exact meanings. Transparent and translucent are words which may once have shared a common poetic meaning in 18th century descriptive writing, but whose meanings were refined with the progress of science and technology. This process in the course of over 200 years resulted in a useful distinction between the meanings of transparent and translucent. Sony’s commercial misuse of the word Translucent is damaging to the English language and to the scientific and technical lexicon; it predisposes future confusion about the meaning of the words. It is also a fait accompli; there is no turning back, since Sony’s corporate stance is much like that of Mrs Thatcher; no u-turns and never admit to be being wrong. They have also no doubt invested hundreds of thousands of dollars in the consultancy involved, and the registration of the term as a trademark, the creation of branding artwork. They could have branded the mirror TransLumina® or, more usefully, just called it a transflecting mirror – transmitting-reflecting. That term is already used to describe the sort of mirrors used in ‘Big Brother’ with cameras behind them. As to whether it’s a true pellicle mirror (a thin stretched film of vacuum coated Mylar or a similar polymer) no-one seems to be clear. It moves out of the way to allow sensor cleaning but could be relatively fragile. It certainly does not need to move to allow 10fps (Alpha 55) or 7fps (Alpha 33) continuous shooting. Sensor dust is often created within the camera by wear and tear on the shutter mechanism, so access for cleaning is essential and the mirror can not be designed to seal the sensor chamber. The Alpha models still have a shutter, that’s the next thing we shall see eliminated. That old rumour of the 15fps silent shooting Alpha DSLR seems to be more than a rumour; we are almost there. For many users, the critical advantage of all four new Sony models will be HD Video with sensor-based in body image stabilisation. This will enable all kinds of lenses from macro to ultrawide or soft focus, manual adaptations and Minolta AF legacy glass to be used for video with confidence. Welcome back the circular polariser, unlike mirrorless ILC cameras these new models will not allow the use of linear polarisers without AF efficiency reductions, but exposure should be unaffected as the sensor itself provides the metering with 1200 zones. This will be one of the tests reviewers need to carry out on the new pellicle mirror Sony Alpha 33 and 55 models – to confront them with not only polarising filters, but conditions in which light is naturally polarised. How will they render sky gradations or reflections off water? Two further Alpha models are being released, which are essentially updates for the 500/550 – the Alpha 580 which will hit the shops before the winter buying season, adding 16.2 megapixels and a 15-zone AF module, HD 1080p video and (non-video) Contrast Detect AF with all Alpha mount lenses. The 560 will not arrive until some time in 2011, using a 14.2 megapixel sensor. More of a landmark than a benchmark, the inclusion of 10fps continuous shooting with active phase detect AF and 16.2 megapixel file size in the Alpha 55 is unprecedented and possibly unforeseen by competitors, in this class of sub-$1000 consumer DSLR (let’s continue to use the term, since they are clothed as DSLRs). The dual format card drive supports the 30Mb/s transfer rate of the latest Class 10 SDHC cards and Sony’s fastest MemoryStick Pro Duo generation. The HD video also has a reasonable 17mbps bitrate. The new technology has been well documented before the launch, but the fine detail of the new cameras is now clearer. The Alpha 55 is some markets will incorporate GPS geo-tagging for stills and videos (we wait to see whether raw files are tagged, and how accurate this is – the accessory Sony geo-tagging system available to date has only permitted JPEG tagging, and has not been accurate enough to know which street in a town the picture was taken in). Rumours that the 33 and 55 bodies would be SSM/SAM only, with no internal focus drive, were unfounded as Sony states clearly that both are compatible with ‘the full range’ of over 30 Alpha lenses (indeed, the product shots of the 33 and 55 alone show the 18-200mm SAL DT lens fitted). The 55/33 1080i/60p (1080p in AVCHD camera archive format) video claims ‘smooth, precise’ phase detect auto focus during video shooting, but makes no reference to this being limited to in-lens motor lenses. Therefore we can assume it works with in-body AF drive lenses as well, and you just have to edit the soundtrack. The new ISO 25,600 mode does not imply a radical sensor change as it is only available using Multi-Shot Noise Reduction, which requires a burst of 6 frames at the 10fps/7fps native maximum speed of the camera, and can not save raw files. The ISO range of the sensors is 100 to 12,800. Is this range quoted as absolute, or after accounting for the semi-silvered mirror light losses? If it’s the range before allowing for the mirror, then the 14.2 megapixel sensor of the Alpha 33 may be more like the Nikon 3100’s sensor than the NEX (ISO 200-12,800) is. Thom Hogan has shown pixel dimensions and size data which support Nikon’s claim to have an entirely different sensor fab line of their own, compared to the A550/NEX sensor. But how about compared to the A33/560 sensor? The 55’s new 16.2 megapixel CMOS will probably appear in the forthcoming Alpha 700 successor, which it is believed will form the main Sony exhibit at photokina (Cologne, September 21st-27th). Both models have a new 15-zone AF sensor with three cross sensors, but not f/2.8 sensors – all are designed to operate at f/5.6 virtual aperture. However, there is a hidden clue that the cross sensors may be f/3.5 capable, as the high-speed shooting modes with continuous AF set f/3.5 by default on any lens capable of this (if the lens is, say, only f/5.6 then the largest aperture is always set). Setting f/3.5 implies that this confers an advantage in focus sensitivity over f/5.6, f/4 or any other particular aperture – and that f/3.2, f/2.8 or wider would bring no benefit. That points to some of the sensors having an f/3.5 virtual aperture. Confusing aspects – Auto HDR is said to be available in P/A/S/M modes. I guess in M mode it must leave the aperture alone and change just the shutter speed. Regular bracketing is still limited to a disappointing 3 exposures at 0.7 EV intervals, maximum. But you’ll love the direct D-Range button which gives access to D-Range and HDR options directly, and the direct Finder/Screen button which toggles between using the very high resolution EVF with its ‘virtual 1.1X’ 100% view of the subject – effective visual scale, larger than the Alpha 700 and larger than any previous Alpha digital model except the Alpha 900 and 850. That’s one of the benefits of the EVF, a relatively tiny display is viewed through a high magnification ocular and ends up with a ‘window’ on the world which beats the tiny tunnel vision of optical finders. Technically it is very similar to the last EVF produced by Konica Minolta on the Dimage A200, with the benefit of five years’ further development. It has the same 60Hz refresh rate and visually almost raster-free RGB. Where the A550 and its earlier stablemates vary slightly around a viewfinder with an effective 0.50X scale (relative to a full frame 100% view using a 50mm lens), the A55 and A33 provide an effective 0.73X and that’s impressive. The ocular is set well back (remember the Konica Minolta A2, and the Sony Cybershot DSC R-1?) because it is a telescope design. This also gives it a very narrow range of possible eye positions, a common feature of EVFs. The eyepoint is close, and you must position your eye precisely. The rear screen uses the same type of (Schott?) reinforced glass with (3M?) resin gel adhesive as Canon’s 7D – this totally seals to the LCD module itself eliminating air gaps, and improves contrast. It is a technology first seen in the 7D and becoming standard across the industry though the NEX has shown Sony to have the best implementation so far. It is scratch proof, by the way, and it can be cracked by impact like any other screen. The tilt-swivel action is borrowed directly from the Nikon D5000. In fact, it’s so identical in articulation it even included the amazingly silly front facing mode where the screen is obscured by your tripod, hanging under the camera and preventing it from being placed on a flat surface for self-portraits or videos. But it has the same benefit as the Nikon, the screen can be flipped to face the camera and protected completely while you use the EVF. Functions familiar from the NEX including Sweep Panorama and Sweep 3D Panorama are built-in and accessed from the main mode dial, which also provides physical settings for all the main modes. Depth of field preview is restored – with the usual button – because is can now actually work. It was always useless in real terms on optical viewfinder cameras, as the focusing screen never represented wide apertures correctly. Now, with an EVF, for the first time ever an eye-level Alpha gives absolutely perfect and precise previewing of depth of field and bokeh effects whatever aperture you are working at – even at f/1.4, which was never possible and still isn’t with the A850 or A900 for that matter (which is why their Preview mode is useful). You can also preview the exact image appearance. By pressing the AE lock button, the auto gain of the EVF or rear screen are turned off and replaced by an exposure-compensated view. So if you dial in -1 EV (using the adjacent dedicated button), and change the WB, and use a different picture style with more saturation and contrast just pressing AE-Lock will immediately preview your image with these adjustments applied. And you can enlarge in the usual two steps to check auto or manual focus. The finder and screen also have a Nikon-style two axis spirit level (flight simulator horizon) display to help you get your horizontals straight and your verticals parallel. It can be activated on either, and does not have to appear on both simultaneously. For movie makers, the binaural stereo microphones are a great move. Even on the NEX, the two small top aperture mics give excellent stereo. The 33/55 mics are placed either side of the ‘prism’ housing, rather like the ears on your head. This will give the stereo image created by these cameras a really natural quality. Natural, that is, to a pygmy marmoset monkey… but still, I will wager, the best stereo image of any DSLR/HybriD. And Sony provide a stereo 3.5mm mic jack socket, though without any manual control of gain levels. I’m sure we will have to buy the A780 to get that. Click the picture above for a big version. Who says Sony does not have a range to match Nikon or Canon, whether or lenses or of cameras? From the left, the cameras show the current range before we even see the magnesium-bodied Alpha 700 replacement arrive. A900, A850, A580, A560, A55, A33, A390, A290. I said all along that Sony wanted to slap a Sony sensor in anything that moved off the shelf. Now Sony got the message to also slap a Sony Alpha lens on anything that moves off the shelf. 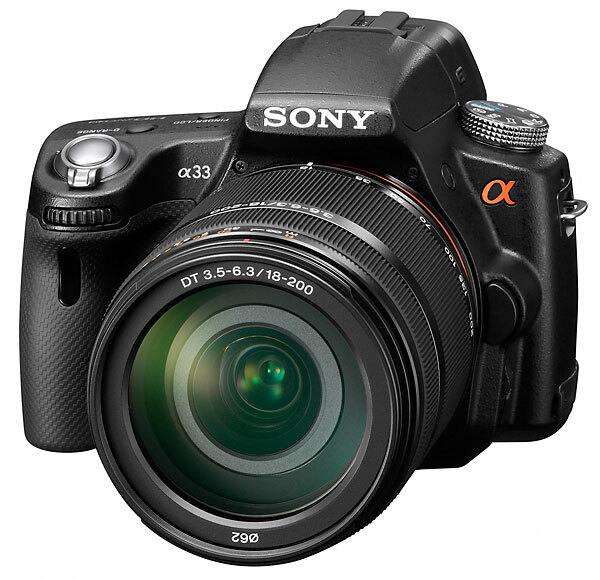 The A55 looks like a Sony compact bridge camera with an Alpha Lens mount and a honkin’ big sensor inside! It may finally be time to upgrade from my Minolta DiMage A1 DSL/EVF camera, perhaps. Except the new “SLT” cameras are is missing so many direct input and direct readout knobs. There’s no traditional rear dial layout for exposure compensation on the back dial, and program shift on the front dial. Can this be accomplished via toggling the front dial using the [Fn] Function button or “clicking” the front dial as a toggle button? We technical photographic engineers need an “A77”, or an “A65 Classic”, if you all get my drift. If EVFs are Sony’s future for all non-Full Frame Sony Alphas, then there might be an A77 or A65 Classic soon. I hope, I hope. So, how many Sony AMC Alpha Mount Cameras does this make? Is it starting to look like the 2, 3, 4, 5, 6, 7, 8, 9, 11 series Minolta cranked out yet over time from the Hi-Matics and the X-series through the Alpha/Dynax/Maxxum lines? The Sony “bridge” bodies imply that Minolta factories either are not making or designing these, or that Minolta made or designed the other non DSLR Sonys after all? Give Sony and Minolta factories another few years and we’ll totally loose count of the modern Sony Alpha line — and they’ve yet to use single and 4-digit model numbers. There is no end to our choices, new, used, and future releases. Thank you, Sony, for expanding and making more and more choices for we Alphatographers. Maybe Sony has read our web chat photographic dialogs somewhere all along. Yes, that is what I meant, the Canon bridge cameras, but also I was thinking of the leaked Canon 60D DSLR image I saw a few days ago. The 60D was announced today and it has the type of LCD I was referring to. 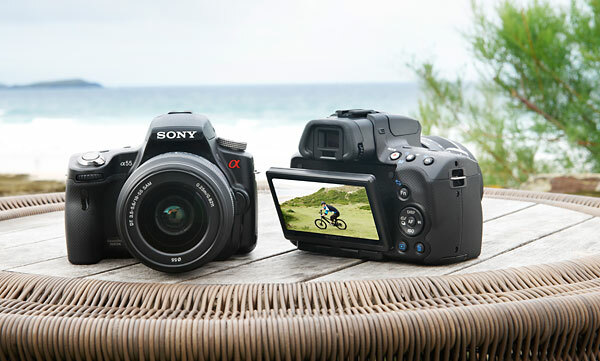 Yes, the NEX and A550 style is very strong, but now with the A55/A33 Sony has created this new style. Like the Canon/Olympus/Panasonic style it isn’t as strong. I think that most of the time the way I would use it I like the NEX/A550 style more even though for verticals it makes the tilt almost useless. I don’t really like the LCD sticking out the side or under the camera, but it allows many more ways to use it. The Canon DSLRs don’t have any articulated rear screens, that belongs only to compact/bridge models. The Olympus articulation allows side viewing, several other makes do as well. Sony seems obsessed by making the rear LCD very strong (the NEX has an action like a bulldog clip – you need to use two fingers and get your nails under the edge just to pull it away from the body). Lots of good info. Thanks! Probably you know this already, but the Canon style of articulated LCD with the hinge on the side rather than the bottom also allows the LCD to be flipped to face the camera and it also allows the LCD to be turned so that it can be seen from the front. It is off to the side of the camera rather than under the camera. Each style has its good and bad points.